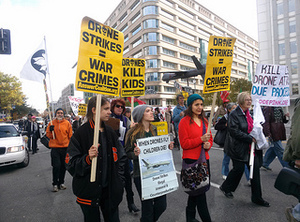 The ANSWER Coalition joined CodePink and other anti-war organizations on Nov. 15 for a march from the White House to General Atomics in protest of the U.S. government's use of drones. The protest was the kick-off event for a weekend of anti-war activities focusing on drone warfare, including the 2013 Drone Summit. Speakers at the White House included a delegation from Yemen who spoke about the impact of U.S. drones on their country. The group then marched to the D.C. office of General Atomics, the company that manufacturers the Reaper and Predator drones flown by the U.S. government. A reading of names of drone victims from Yemen and Pakistan took place at both the White House and General Atomics, and the event was concluded with a symbolic die-in at General Atomics.